Florida has been blazing in the 90’s since April, so our thoughts turn north, where we hope it will be cooler, as it was last summer. We’ve been busy preparing for our August Summer Tour- check for tourdates on our SHOWS page & hope to see you all on the road. Be sure to say hello & visit the merch table- one new item this year! Enjoying some good Florida gigs before we leave, including a special concert with the amazing Bob Seeley at the Side Door July 10. We’ll also be sharing the stage with Bob at Cincy Blues Fest (Ohio) Aug. 8 & Bloomington Boogies (Indiana) Aug. 9. Speaking of Boogie Woogie, our 6th Annual Boogie Woogie/Blues Piano Stomp at The Palladium in St. Pete on March 21, 2015 was another sold-out success. This year featured Mr. B (Ann Arbor, MI), Bob Seeley (Detroit, MI), Victor Wainwright (Memphis. TN) & ourselves. Congrats & thanks to these Frequent Fan winners of 2014: #1 Dan H., #2 Diann F., #3 Judy R., #4 Teresa W. who each attended at least 40 shows! Plus #5 Linda M., #6 Wayne K., #7 Barry S., #8 Judi L., #9 Priscilla H. (all attended 20 + shows), #10 Bob S. #11 Shirley S., #12 Sarah S., #13 Marlyn P., #14 Susan S., #15 Jim I. and #16 Walt H. (all attended 10 + shows.) Ask for your free card at any show & join the club- the more the merrier! RIP musicians David Maxwell, Rocky Ruckman & B. B. King; fans Rick Graves & Barry Simms, & a fave English teacher of mine, Mr. James Creighton. Happy Anniversary June 18 to Dr. Blues! Exciting news! We (along with other Tampa Bay blues celebrities) are on the cover of the Oct./Nov. issue of Big City Blues Magazine, a renowned national blues publication based in Detroit, MI. There are extensive interviews of each featured artist, and it’s been fascinating reading about our peers. Visit their website to find outlets for this magazine in your area, to order copies or to subscribe, which we recommend. See our LINKS page for their website. Ironically, the last time we were featured in a national magazine was the Fall 1994 issue of Blues Revue, and only Liz’s name was on the cover. Hope we won’t have to wait 20 more years for the next one! Thanks to everyone up north for a great Summer Tour. The highlight of the tour was meeting our newest fan, great-niece KHORA at the Cincy Blues Fest when she was two weeks old! Another highlight was hanging out with our pal ROY BOOK BINDER at Liz’s mom’s farm in Hackney, Ohio & our show together at the ADELPHIA MUSIC HALL in Marietta. It was also fun to celebrate Liz’s sister MARY’S 50th birthday with family. Can’t believe the holidays are fast approaching. Please visit our STORE Page to order unique gifts for yourself & others. We’ve been busy preparing to hit the road in late July for our 2014 Summer Tour up north. See our SHOWS page for upcoming dates & festivals in Ohio, West Virginia, and Indiana. If you’d like to book us for your festival, club or house parties between Florida & the midwest this summer, please contact us right away. We’re excited about brand new posters we just got this week- the first official new posters since 2003! Look for them at venues we’ll be playing. We’ve also been working on some new original songs for the next (7th!) album. Please visit our merch table or STORE page & buy some CD’s, etc.- gotta make room for a new one! On January 19th, Liz & I saw LEON RUSSELL perform at Vinoy Park in St. Pete- awesome as always! We also caught Bonerama at Ringside Cafe, & Lauren Mitchell Band opened for Vanilla Fudge at Largo Cultural Center in April. Our 5th annual BOOGIE WOOGIE/BLUES PIANO STOMP at the Palladium Theatre in St. Pete on Feb. 22 was another huge success. Featured performers this year were ROB RIO (CA), CHASE GARRETT (IA), BOB SEELEY (MI) and ourselves, and this was our second SOLDOUT Stomp in a row! Bob, Chase, and Rob all did amazing performances. Special thanks to Paul Wilborn at the Palladium Theatre for making this event possible, & all of you for being there. On March 11, we bought a new (to us) car! It was mighty sad to trade in our beloved 2002 purple PT Cruiser, (see photo inside our Boogie Woogie Staircase CD) but if you catch a glimpse of our new car, you’ll see we got the next best thing to it. Thanks to Bruce at Bay Pines Automotive for the advice, & Rob Rio for the license plate cover! It was an honor & pleasure to be included with several Tampa Bay blues musicians & luminaries in a photo shoot at the Don Cesar Resort on April 14th. 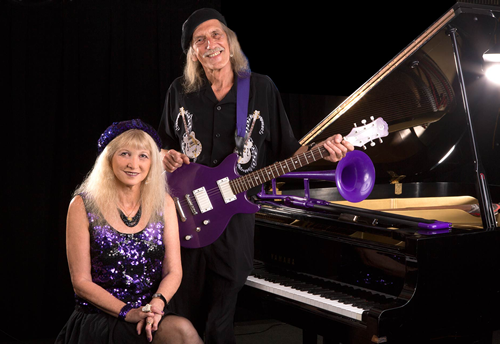 BIG CITY RHYTHM & BLUES MAGAZINE is doing a story on the Suncoast Blues music scene, and the group photo will appear on the magazine’s COVER this fall. BIG CITY RHYTHM & BLUES is a fine bimonthly blues magazine- check them out & subscribe at www.bigcitybluesmag.com or ask for it at your local newsstand or bookstore. Congrats & thanks to these FREQUENT FAN winners of 2013: #1 Winner (attended at least 50 shows!!) Diann F., #2 & #3 (40 shows each) Dan H. & Judy R. -wow! Those who attended at least 20 shows were Priscilla H., Judi L., Barry S., Linda M., Teresa W., Wayne K, & Jim I. Attending at least 10 shows were Hildegarde & Ralph N., Jean M., Barry H., Art O., John & Helen M., Sarah S., Bob & Gwyneth S., Edna P. & Terry G. These loyal fans & more of you truly make the crowd livelier & larger, & therefore help keep us working. Join them & get your free card at any show. Speaking of fans, we had some real surprises at some gigs this year, including the Garris’ from Ohio & the Pearson’s from St. Augustine/WV. We were floored when Beth B. from Ohio walked in one night- she was one of our best Columbus fans & we hadn’t seen her in years! Sadly, in addition to losing my mom April 9, our good friend and fellow musician CAPTAIN BOB THOMPSON passed away in St. Pete on December 25th, 2013. We attended each other’s gigs when possible & Liz & Bob often did a cool duet of “Deep River Blues”. We also lost 2 of our (above mentioned) Frequent Fans recently: Bob Starr on June 20, who always came out with his wife Gwyneth, & Jim Isaacs on May 1, who always asked for our original songs. They were all wonderful supporters of our music & are deeply missed. We flew to Ohio May 30-June 9 for Mom’s Memorial Service & also niece Shannon’s wedding to Bharat. It was wonderful to visit with both of our families, including our 18 month old grandbabies. We even got in some really tasty barbeque at cousin John’s Canal House in Tuscarawas- we play there Aug. 15, so come hungry! We were sorry to lose Doc’s mom GENEVIEVE SHAMBARGER (aka “MOMMA BLUES”) on April 9th. At age 94, we were blessed to have her in our lives for so many years and to share so many happy times. Many of you met her at various shows in Ohio & Florida and knew her youthful spirit & zest for life. Hi, everybody! Finally dipping down below 90, so must be fall in Florida! It’s so good to be home after another successful Summer Tour. Liz & I returned to St. Pete in mid-September after hitting five states (Ohio, Indiana, West Virginia, Kentucky & Virginia) over our seven-week tour. On our way northward, we visited our son Drew, his wife Kristen, and our grandtwins Jackson & Julie (they’ll be one year old on Oct. 21st!) in Huntsville, Alabama for a few days before heading up to Cincinnati for the Cincy Blues Festival (our 19th year there). Great to see old friends and all the musicians at the Arches Boogie Woogie Piano Stage. We also enjoyed playing DOC’S PLACE in Lebanon, OH the next week & seeing Liz’s three sisters & nieces there. Another highlight was performing in Indianapolis at TASTINGS and at THE SLIPPERY NOODLE. At “The Noodle,” we were pleased to see pianist KEVIN WILDER from St. Pete (now relocated to Indy), and also ANDRA FAYE (from Saffire: The Uppity Blues Women) with her guitarist Scott Ballantine. All three musicians sat in there, and Andra Faye sang Liz’s song “Take It Slow” with us. A very cool evening! The CANAL HOUSE in Tuscarawas, OH was a fun gig with so many relatives it seemed like a family reunion! So good to see Mama Blues there, too, still going out at 94. We helped her sort & pack up her Ohio apartment & on Labor Day weekend, my 2 brothers were there to help also. Though bittersweet, it was good to have everyone together in New Philly one last time. She’s now living in Nebraska with brother Charlie, so we’ll be looking for gigs there next year. After playing the ADELPHIA MUSIC HALL in Marietta, Ohio (Liz’s hometown area), we headed southward to Glade Spring, Virginia where we performed at LOUIE’S ITALIAN BISTRO for the first time, thanks to our friend Theresa “T-Bird” Priest who now lives there & helped us book this gig. It was great seeing T-Bird again after almost two years! Liz was featured on WEDU’s “ARTSPLUS” show on PBS, which aired on Tuesday, July 11th. Watch your local listings for this show, & let us know if you see it in your area. See our LINKS page under “News & Reviews” to view. Liz & I celebrated our 30th Anniversary on June 18th, 2013. That’s thirty years of marriage AND performing together. Lots of great memories, fun times, and, by my estimate, over 3,000 gigs! 2013 also marks 20 years since “Walking Mary’s Blues” was released, 10 years since “Live in St. Pete” was released & 5 years since “Boogie Woogie Staircase” was released. Time flies! We sincerely appreciate each of you who has bought these albums over the years & keep us going with your support. With the Holidays fast approaching, please consider our STORE for gift-giving. Thanks to Sam Johnston for the new promo photos…taken at the Side Door in St. Pete in June. We’ve been invited back to Paris, France to perform at the INTERNATIONAL BOOGIE ET BLUES FESTIVAL on January 17th & 18th, 2014. See our SHOWS page for more details & sign up for our email list to be reminded about all gigs. Our 5th Annual BOOGIE WOOGIE/BLUES PIANO STOMP is slated for Saturday, February 22nd at the Palladium Theatre in St. Pete. The amazing Bob Seeley will be returning for his fifth appearance at the Stomp, along with two other piano players TBA and us. Last year’s Piano Stomp was SOLD OUT; watch this site & your email for ticket info soon. Meanwhile, we’ve been enjoying great crowds at JAXSON’S ON THE BOULEVARD in St. Pete Beach, & other local spots. Look forward to seeing you Florida fans, tourists & snowbirds in the crowd again soon.